And so the challenge started today – Ash Wednesday, day 1 of Lent. Cereal – switched to Weetabix, check. Cereal bars in morning – a no-go, switched to yoghurt, check. Tea tonight – leftover pasta, Dolmio sauce and tuna. No garlic bread tonight though … check. I love Co-op and Sainsbury’s, as they are much more likely to admit to Palm Oil when it’s there, and not just disguise it as “vegetable fat”. However, though I know the likes of Hovis and Warburton when they produce processed sliced bread use palm oil, I’m hoping that bakery-bought bread shouldn’t have palm oil included. However this bread must have been produced off-site and while having the appearance of fresh bakery bread, still has palm oil contained within, so it has to go. At least the local birds are going to be happy today. Good for you on giving up the cereals and bread, from a health perspective you’ll feel much better too! What is it exactly that you are giving up? bread specifically or grains? I must say I have never ever seen a label over here (Australia) labelled Palm Oil directly… I hope one day that is the case. Thanks Justine! I’m not planning on giving up cereals or bread, I’d be lost without them! Just not knowingly consuming anything with palm oil. As for labelling, yes at least there are two supermarkets that label palm oil honestly in their own brand products. It’s great because if I don’t see it mentioned, I know that instead of generic “vegetable fat” they are specifically mentioning the vegetable oil they use, e.g. sunflower or soy. We as consumers, and I specifically, need all the help we can get. I have finally found a non-artisan supermarket bread this autumn that contains no palm oil or palm fat – a new line called Hovis Seed Sensations soft granary 800g. 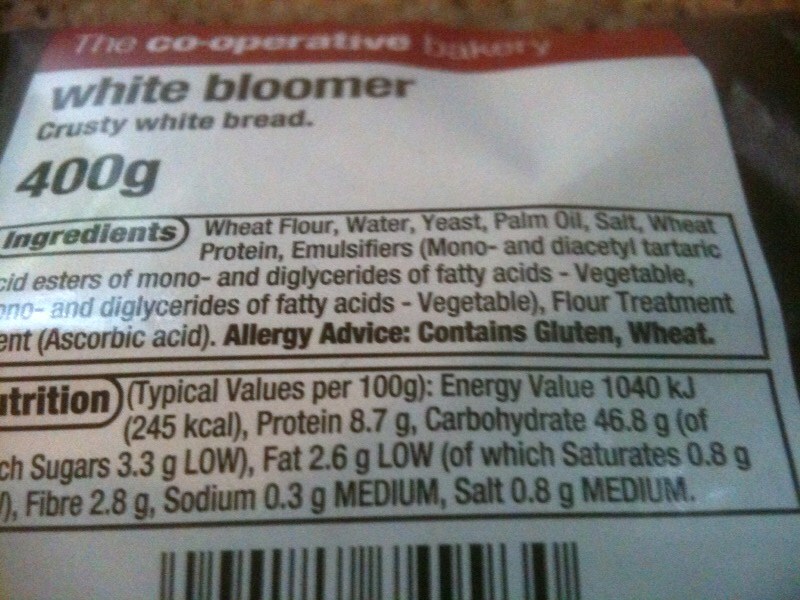 I have just bought some today after abandoning my usual loaf – as the new regulations mean I can now see what type of “vegetable oil” is in the bread from list of ingredients. For example the all bran flakes cereal (usually cheap labels to be honest) don’t have Palm oil and a found a box of Cheerios which didn’t either (though these last ones have sunflower oil). I don’t wanna make publicity to any supermarket but tesco has a polish sliced bread with no Palm oil…it does get off in 2or3 days and it’s consistency is different to other breads…but we all love it in my house..
It’s all about searching and finding the foods right for u…the market is generally full of Palm oils, fats, and sugars…but I believe it will change if we change our eating habits. This entry was posted on February 17, 2010 at 7:39 pm and filed under Uncategorized. You can follow any responses to this entry through the RSS feed. « Palm Oil Free Lent?